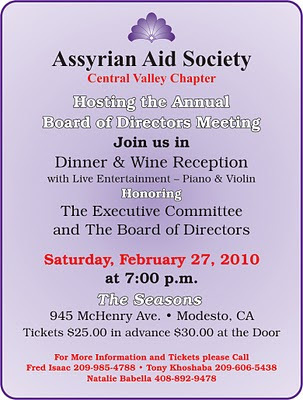 On February 27th 2010 the board of directors and the chapter officers of Assyrian Aid Society of America will be in Modesto, California for the annual meeting. The day long meeting will be followed by a dinner reception at The Seasons Banquet in Modesto at 7:00 pm. In the event there will be a piano-violin presentation from the music of late Sooren Alexander the legendary Assyrian folklore musician. For more info click of the image below. The Assyrian Writer, George Yana, who has published a book titled "Ancient and Modern Assyrians" recently sent us the following encouraging comments about our Mesopotamian Night 2009 project that we would like to share with the readers of this blog. The music of Paulus Khofri is beautiful, and I consider it one of the main attractions of this concert. Loraine Davis is amazing and the audience loves her. But, Samuel Khangaldi stands out; his overture to the Oratorio of Gilgamesh is a gem. I had never heard his name (Khangaldi), and now we are facing a new William Daniel , or shall I say, an Assyrian Khachaturian or Alan Hovhaness . I think the Assyrian community, that is Mr. Tony Khoshaba , Mr. Obelit Yadgar , Mr. Narsai David and others, should see to it that this overture to the Oratorio of Gilgamesh is played by world class orchestras, such as the San Francisco Symphony, the New York Philharmonic, the Philadelphia Orchestra, etc, depending on where we can be successful. Once this is accomplished, the radio stations will begin to broadcast it, and, hopefully, the rest of the world will catch up with it. This piece of music, in addition to being beautiful and oriental, has a certain mystical character that befits its title. When I first played it, Marie-Therese , my wife, who is hard to impress, came in and asked “whose is this?” I am mentioning this because her ear, like mine, is used to hearing classical masterpieces. Congratulations, you have provided a stage for our talents to flourish, and I hope that this beautiful beginning will continue its ascending course.